In spite of mankind’s triumph in taming nature for his survival and benefit, succumbing to the vagaries of nature has become a regular global concern. Out of the array of different catastrophes, earthquakes and cyclones together are responsible for an overwhelming majority of the global damages caused by natural disasters in the last decade, leaving millions homeless. The loss of property and life are primarily due to failure of structures to withstand such catastrophes, caused often due to lack of implementation of a few guidelines. The evolution of these guidelines is rooted in understanding the principles of the mechanics that regulate the behaviour of the structures under lateral dynamic loading imparted by earthquakes and cyclones. 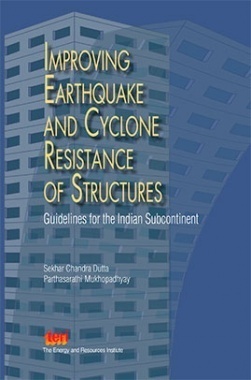 In this context, Improving Earthquake and Cyclone Resistance of Structures: guidelines for the Indian subcontinent, is an attempt to introduce guidelines for the types of building structures frequently observed and built in the Indian subcontinent as well as in other developing countries. The guidelines are meant for both architectural and structural features, and include constructional aspects as well. The book introduces these guidelines in such a manner that all aspects can be properly understood, related, and implemented by practising engineers and architects. On the whole, the book may help develop awareness and sensitized technical manpower for combating the threats posed by natural disasters like earthquakes and cyclones.